During the day this burger shop on an industrial street in Brookvale gets smashed by hungry tradies, so in that sense the location isn’t as incongruous as it appears when you visit this dark thoroughfare at night. 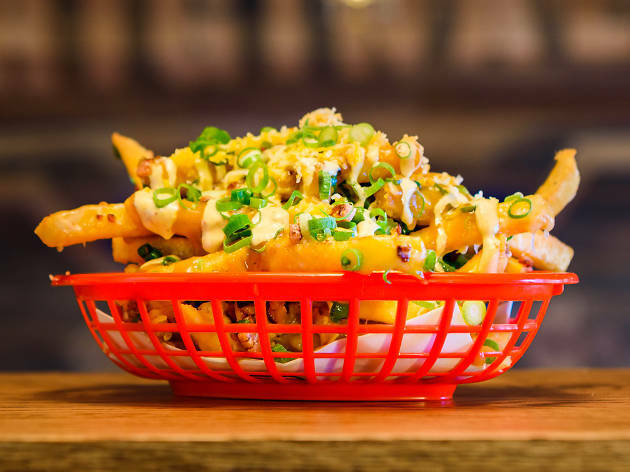 But that's not stopping anyone from heading here when they're craving a little Americana, because this backstreets burger shop is raising the bar for suburban grills everywhere. Sure, they’re hard to eat and guaranteed to destroy whatever outfit you’re wearing, but if you like a towering, impractical burger, you can get one here on the specials list, (for August it’s a beef patty, maple syrup bacon, onion, tomato, lettuce, beetroot, fried egg, pickled pineapple, and double American cheese) but for our money it’s all about the regular menu - simple, handheld affairs with a proper meat to bread ratio, a respect for the yin yang balance of sour pickles and creamy mayo. If you’re nervous about committing to a blue cheese burger, know that the sauce on the fried chicken burger is very mild, but extra savoury due to the cheese addition. But the secret weapon of this burger shop is what makes their chilli burger stand out – they make their own hot sauce in-house from Carolina Reaper chillis and it’s a showstopper. It’s fresh, fruity and properly hot, but not in a sneaky way. The heat goes up in even increments, so you don’t suddenly become the mayor of a mouth volcano after adding one drop too many. They sell the sauce by the bottle and you will want to take it home with you and put it on everything you eat for the foreseeable future. In fact, enjoy it twice and get a serve of the wings that come standard with celery sticks and blue cheese sauce. Or you can eat them how the kitchen recommends and add rings of raw, white onion, which sounds crazy but is totally delicious – the fresh, bite brings the fat and spice into sharp focus. 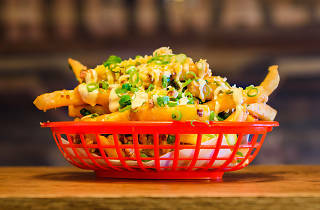 Loaded fries can either be a shortcut to Nirvana or a profound disappointment, but here they’ve got their ratios spot on - a mild, natural gravy, the creamy house special sauce that works like a more liquidy mayo, the right amount of cheese so your super crunchy chips don’t become an immovable brick as the dish cools, and green onion and bacon bits for salt and spice. And just when you thought you couldn’t like these guys more they go and double down on community spirit by offering a $5 burger to people attending the local rugby league games over in Brookvale Oval. What a bunch of legends.